Disclosure: I received a gift card to help facilitate the review. All opinions stated are genuine and my own. 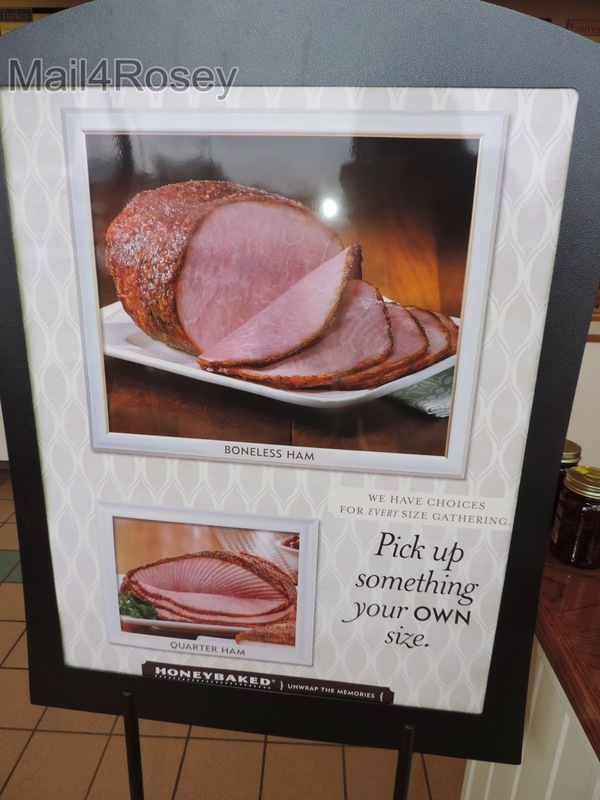 HoneyBaked Ham has over 400 locations nationwide. We visited the Ann Arbor, Michigan location. This is my husband. He does not get excited about shopping. He DID, however, get excited about shopping at The HoneyBaked Ham Co. The HoneyBaked Ham Company has been around for over 40 years, and oh yes they do know how to do dinner right. 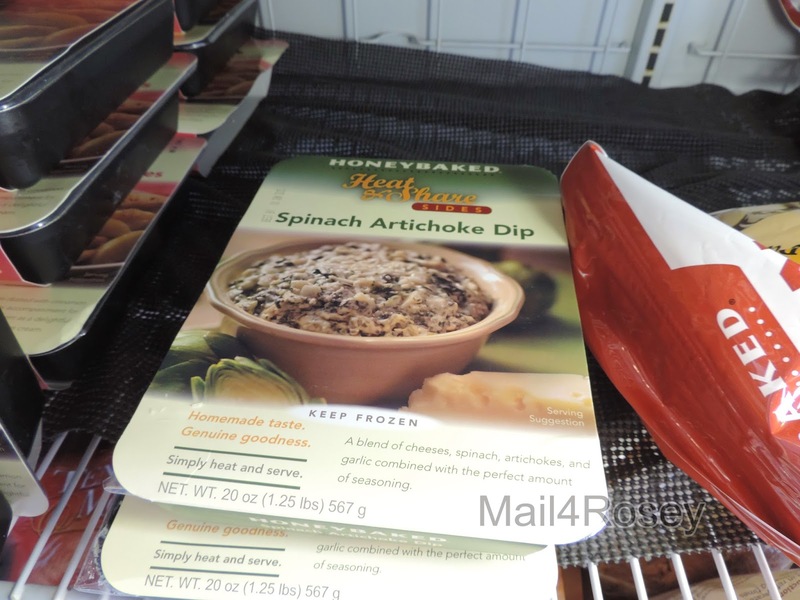 We recently visited the store in Ann Arbor, Michigan, where we found a great variety of foods. This store literally had most anything you could think of for the dinner table (and breakfast or lunch too, but that is a different story). All of the choices were fan-taaaas-tic for any big dinner. Why because all of the hard work is done for you! Really! Just one the many displays holding their succulent hams, bacon selections, turkeys, and the like. HoneyBaked Ham selects only the finest cuts of bone-in ham, then they cure it in their secret marinade and smoke it for hours over a unique blend of hardwood chips. A crunchy sweet glaze that echoes with the ooh's and ahh's you will hear from your family when they dig in, completes the happy picture. Then they slice it in perfectly even slices, and wrap it in foil so you can conveniently heat it up,if you choose to do so. Get just the size you want/need for your family gathering! You can get any size you want, and we opted for the de-boned, pre-sliced 3.7-pounder we saw, that made my husband have a twinkle in his eye. My husband does not get excited about shopping, but let me tell you, he was excited to go to The HoneyBaked Ham Company. He was literally like a kid in a candy store. The side dishes are all pre-made and taste like you've slaved over the stove for hours. HoneyBaked Ham also has sides that you just heat and heat. Fantastic selections that are already made with tender-loving-care, and only need to be heated. These are packaged like the sides you might find elsewhere, and that is for convenience and display. They do not taste like the frozen sides you would find in a typical grocery store though...oh no, my friend, these are much, much better and taste just like they are homemade. There are sides like Spinach Artichoke Dip to get you started. And then there are the potatoes, stuffing, and vegetables. Selections like Green Bean Casserole, Green Bean Amandine, Potatoes Au Gratin, Sweet Potato Souffle', and Herb Stuffing, to name a few. Cinnamon Apple Slices add a sweet treat to a family meal. 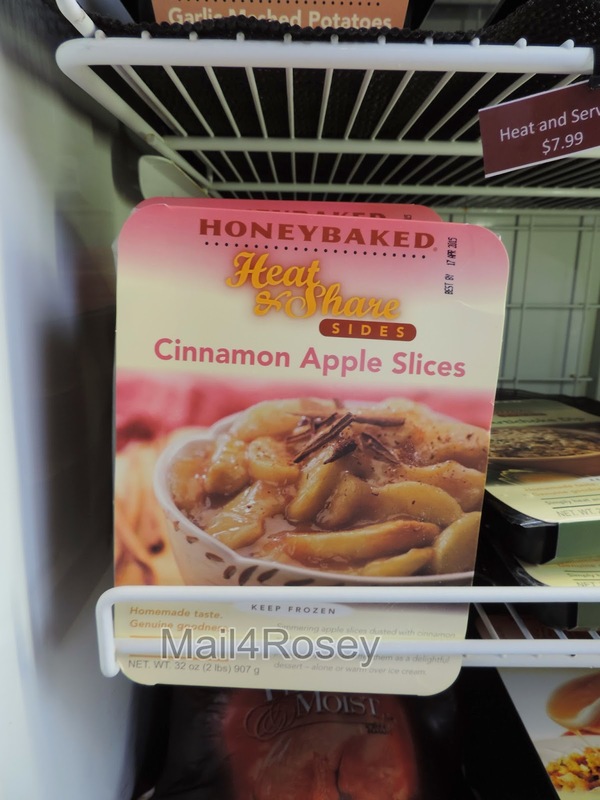 One of the great dessert selections offered at The HoneyBaked Ham Company Store. To end the perfect #HoneyBakedEaster meal, there are sweet dessert selections to add to the family dinner table, such as Cinnamon Apple Slices or (my favorite) Carrot Cake. 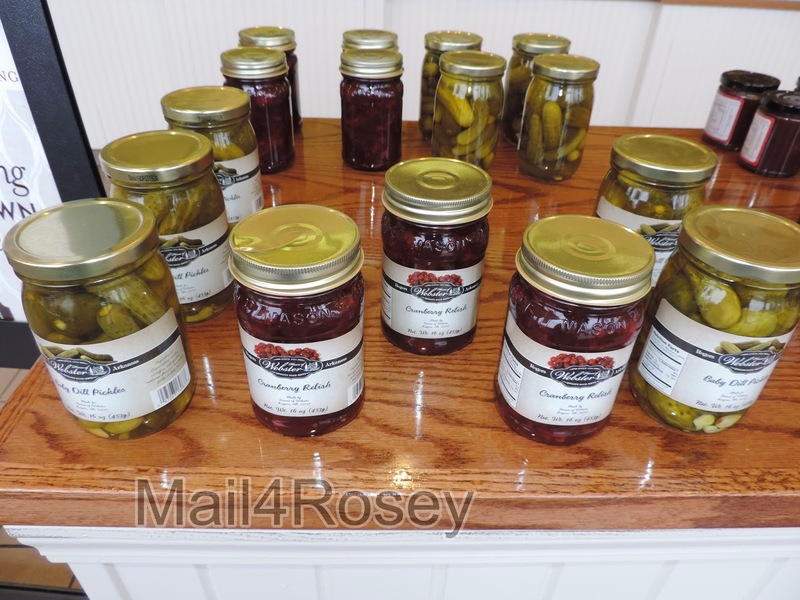 HoneyBaked Ham also has great condiments to add to the table too, like Cranberry Relish, different flavored preserves, Cranberry Walnut Chutney, and Gourmet Mustards, just to name a few. And if you're looking to make the presentation even better, they've got serving platters, ham holders, etc. placed all around the store for your shopping convenience. They really have thought of everything. How to make a husband happy to go shopping? Take him to The HoneyBaked Ham Co.
Hubby packed our purchases up in the back of his car, and we headed home. We planned our meal, and invited family over for a pre-Easter dinner (remember, my Mother-In-Law likes to do the actual on-the-day meals). Everyone was happy to oblige, and the dinner was on! When our dinner day arrived, the side dishes actually took the longest to make, but were still a breeze because all I had to do was heat the oven, & bake as directed. They were finished in 45 minutes flat (and no mess to clean up!). The ham I heated on a low temperature for just long enough to get it hot (the way my family likes it, but remember it's already pre-cooked so you don't even have to do that if you do not desire it warm). I had an entire and very delicious dinner, complete and on the table in less than one hour. Even better still, my prep time in the kitchen took only minutes. HoneyBaked does all the hard work for you. The thing that took me the longest to actually do myself, was set the table. No kidding. That crunchy sweet glaze, & tender smoked meat was such a big hit for our pre- #HoneyBakedEaster Dinner! When I put the food on the table, everyone was impressed with the way it looked, and they were even more impressed with the way it tasted. The showstopper though, was the ham. 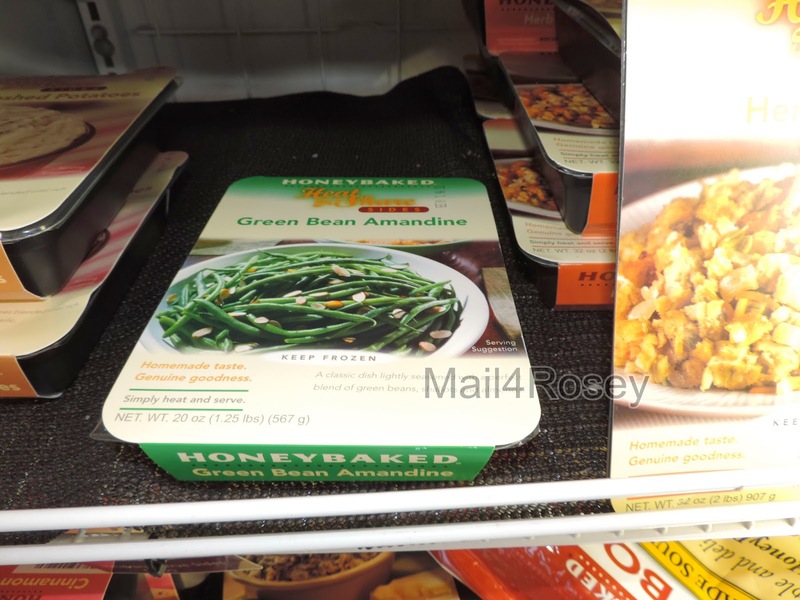 You just can't beat the flavor of the succulent smoked goodness made up by The HoneyBaked Company. My advice after visiting The HoneyBaked Ham Co.? Start a new tradition with a #HoneyBakedEaster. You get a memorably delicious meal, with prep and clean-up time so easy that you will actually get to spend time with your family. And everyone knows that quality family time is always the best part of a special occasion dinner. You can learn more about HoneyBaked Ham by visiting their website (where you can have their products delivered), visiting a local store, and/or following them on Facebook. 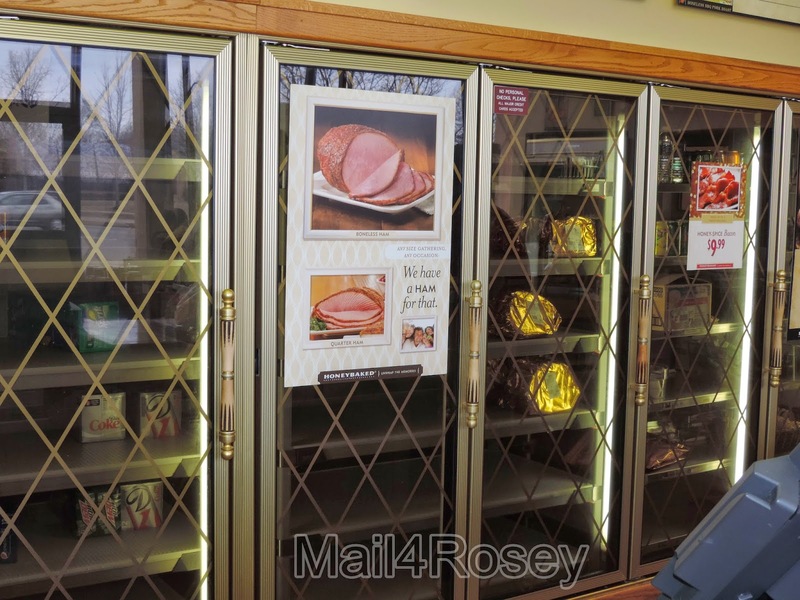 (20) lucky winners get a $50 gift card to try HoneyBaked Ham on their own! Yeah, 20!! That's exciting. Thank you HoneyBaked Ham! Ermehrgerd! I love Honey Baked Ham. My mom got to where she always bought our Thanksgiving, Christmas and Easter meats there. Plus, the store that we lived near did lunch, and talk about awesome sandwiches. I had no idea that they had all the sides, desserts, condiments. Oh please let me win! 20 winners for this one, that's a good thing. :) Good luck! Wow, this is an excellent idea. Hubby and I have been doing Thanksgiving and Christmas dinners for years. We aren't going to this year, but the work is backbreaking and our family doesn't help with anything. Bless their hearts. We have a Honey Baked Ham every year and they seriously are the best. We have a store by us that only opens at Christmas and Easter time. SOOOOO good. Thanks for the idea for Easter dinner! I miss having ham dinners and this collection looks very yummy!! Yeah, there is one about 20 minutes from where I live. Whoa! 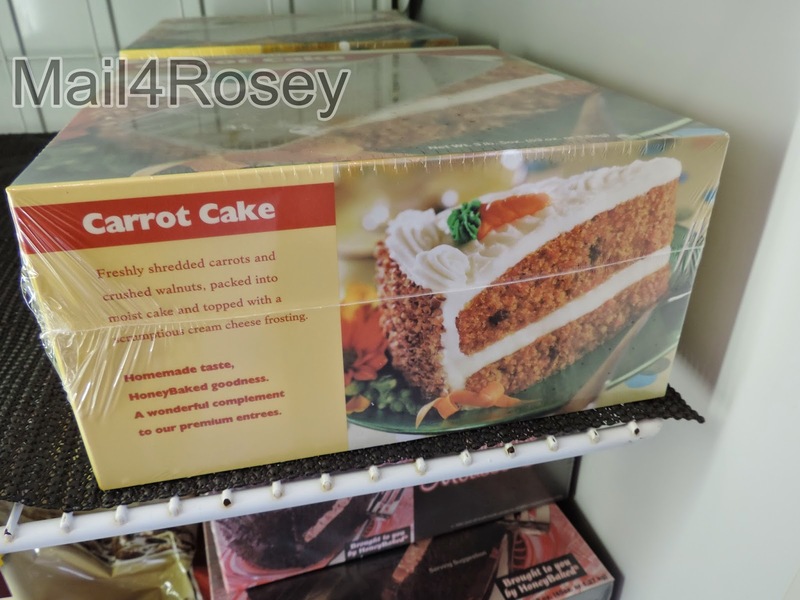 We don't have a Honey Baked Store near us, but I wish we did - that carrot cake looks delicious! Oh now that is the way to put together an Easter dinner! Yum! I would love to create a meal out of all that delicious Honey baked ham! We don't have a Honey Baked near us. I've heard great things about them, I'd chevk them out. I didn't know you could just get a hambone! Now I have to pick one up for my soups! That ham looks perfect for Easter Dinner. I do not think we have a Honey Baked near us. But I bet they are good! I love ham, it is my favorite! I love their turkey roast with honey. We don't have a store near us, but I could buy online! Yummy! I great up on honey baked ham and still love it! I love ham for Sunday dinners! If they bring one to California I'll find it. Ham is what we usually have for Christmas and Easter, these look great and the artichoke dip sides...YUM! We always have ham on Easter...YUM! Honey Baked Ham is so awesome! I'm all about having the big family holiday meals catered. More time to spend together, and less time in the kitchen! It's fun to see a man happy about shopping. And surely I'd love to taste this. I didn't even know we had a store here. It shows up on zipcode so I'll have to check it out. I didn't know we had one close by either, until now. We'll be going back, no doubt about it. I LOVE ham! Yours looks delish! I would love to visit one of those stores but they are so far! 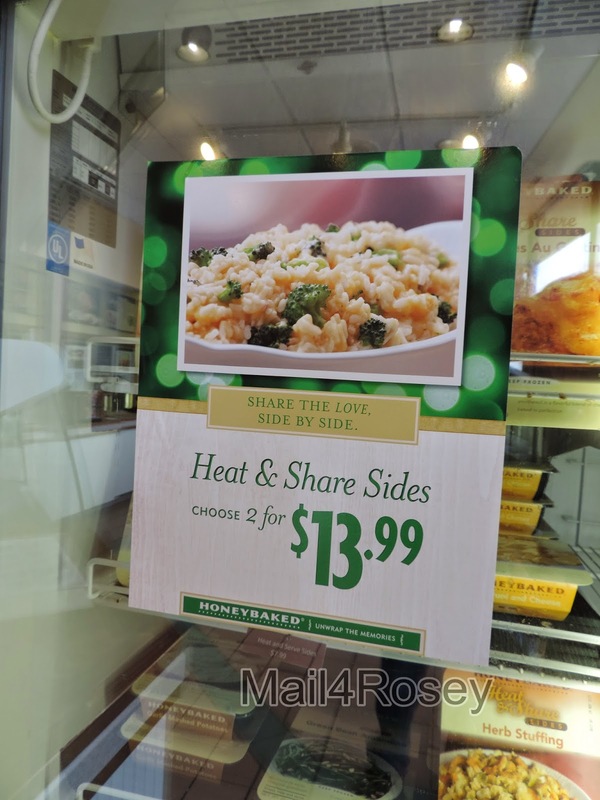 Honeybaked puts up a order station in my local grocery store around the holidays. They have samples and everything I have tried from them is delicious. I really enjoy a good honey baked ham I actually had lunch at there local store yesterday so good. We love having Honey Baked Ham sandwiches for lunch. I have also had them cater our husband's family dinner at Christmas one year -- that made for a stress-free get together!! We love honey baked ham and never think to do it for our Easter feast! Crossing my fingers on the giveaway which incidentally 20 winners, wow!!!! I agree with your husband, ham IS exciting LOL! I'm excited about that ham holder, I've never seen that before. I didn't know Honeybaked Ham had heat and serve sides, good to know. Their food is good. I'd love to win this. Honey Baked Hams are so good! We usually have one on Christmas Day. Our family takes food pretty seriously as well. If the "traditional" foods arent all in attendance someone is complaining! 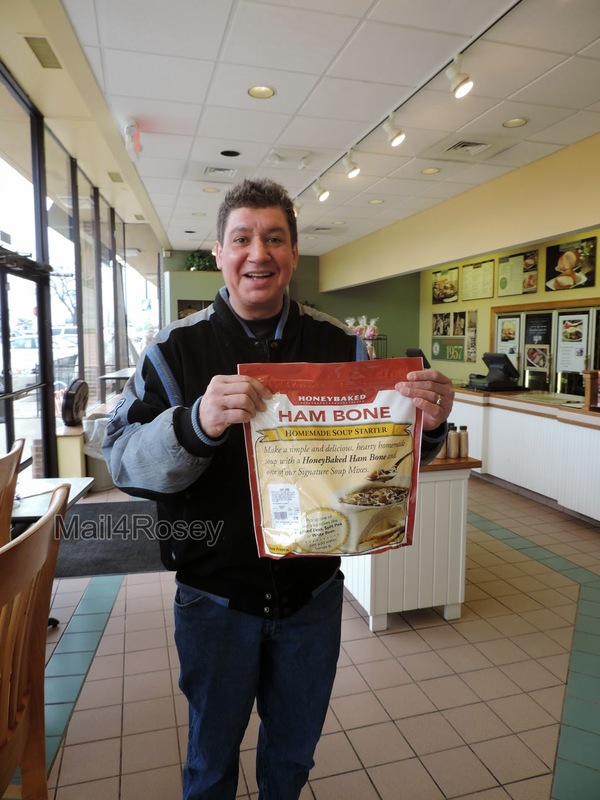 We have been enjoying Honey Baked Ham products for over 20 years. It is simply the best ham there is. And my husband just loves their beans! This ham looks scrumptious. I only eat ham once or twice a year, so I want it to be good. We love Honey BAked Ham. They always have the most delicious items. yummy! I love ham. Looks like you have a great giveaway, too. I've never had their ham before but I remember driving by a store near Easter and seeing people lined up. Must be some good stuff! Wow. Looks like they really have everything. Thanks for sharing the great pics. I just love a big family dinner! I don't, however, enjoy fixing it...or the clean-up! This looks like it would be right up my alley. I so enjoyed seeing your husband! Your son looks so much like him. They both have lovely smiles. I love ham. That one looks so good. All the sides too. I totally love hams and those are looking good and yummy to eat! I love honey baked ham. In fact, I just picked up one for my mom's birthday! How funny you should post this. I was just telling hubby that I was craving some ham and mashed potatoes and Easter can't come fast enough! Those hams look scrumptious! Their hams really are the best. And, the hambones are great for soup. My friends own a Honeybaked Ham and the one time I went it was delicious. Great idea for Easter too. 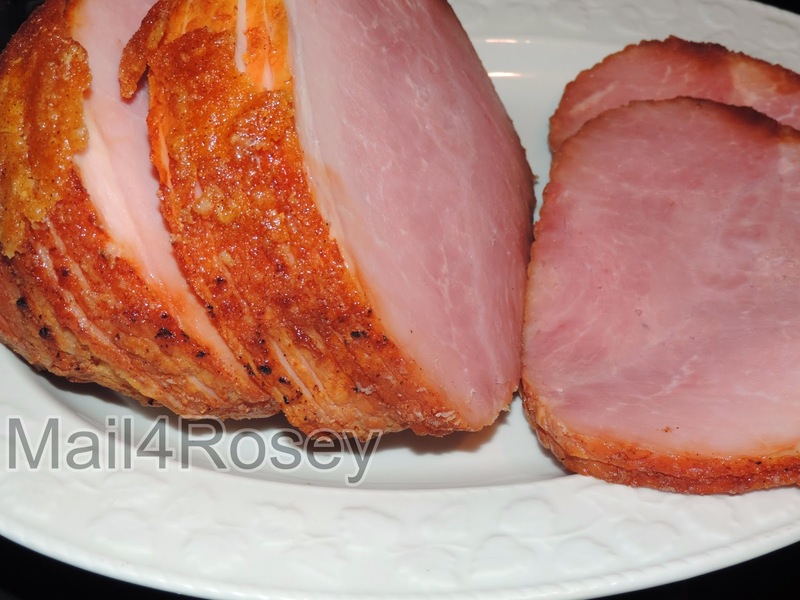 Honeybaked Ham is perfect for Easter. Great taste and saves me so much time! HBH is my go to place for the holidays! They have such a great variety of food! I love Honey Baked Ham at Easter time. I hope I am one of the 20 winners. 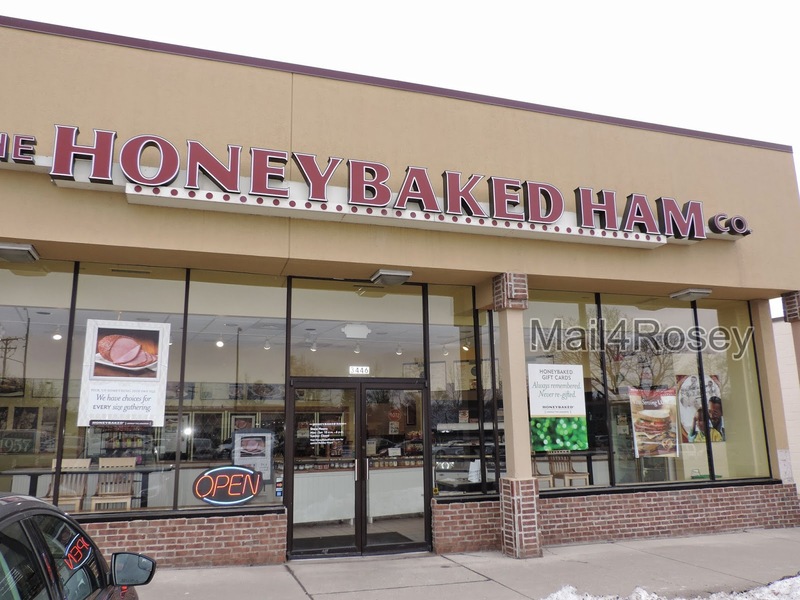 Honey Baked Ham sounds so good right now. I'll have to get one soon. I have no idea if we have one of these places overly close to me, but the food looks good so I hope so! I entered, I hope I get to be one of those lucky 20!! Honey baked hams are sooo delicious. My mouth is watering as I type this. We were just discussing our Easter Ham the other day. I have always wanted to try Honey Baked Ham but my husband worked for a company that was a competitor and we could not due to the employee agreement. He no longer works there and guess what will be on my table for Easter!!!!! I can not wait - hope to win. Wow! 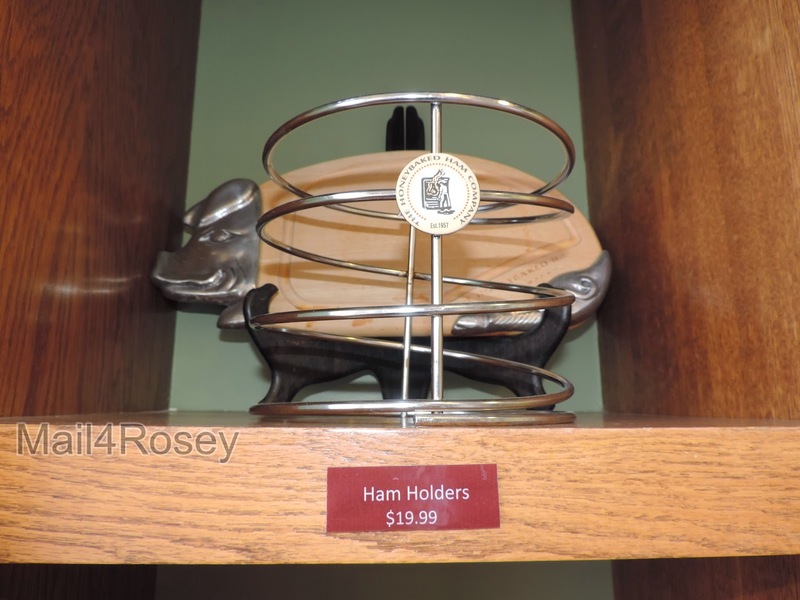 I love that ham holder they sell. It's t0o cute! This one I just had to enter! I wonder if they sell this brand near where I live-I will go check! I've always heard such good things about them. Honeybaked is our favorite ham! Easter & Christmas would not be the same if we did not have a Honeybaked Ham! DELICIOUS!!!!! they have tons! oodles!! and now i'm drooling wishing i had one for dinner tonight. Honey baked ham is SOOOOOO GOOD! Yours looks delish. We love Honey Baked Ham! I didn't know about the spinach dip, I'll have to grab that next time! Their ham is out of this world. You're not kidding! I had no idea they had all the sides available like that though. It's awesome. Just in time for easter. I need to buy a ham. That looks delicious. LOVE Ham! We are going to have on at Easter. Looks delicious. Honeybaked Ham is ABSOLUTELY hands down the best ham EVER. I remember waiting in line with my Grandma to get inside to get a ham - the line would be outside, and wrapped around the building! We have one of these stores not too far away and I've heard great things. And now I know what I will do if I ever have to handle a holiday meal on my own. Thank you for sharing! I love honeybaked ham. I had no idea they had sides. How will you contact the winner? I didn't notice giving my email and was curious. Your info. registers on the Rafflecopter when you use it (you have to put in your e-mail if you're not signed on to Facebook). Good luck w/the giveaway! Honey ham, yum! I Too bad, the store is not available in our area but it does in my sister-in-law. So, I will let her know since she was getting tired of cooking big meal for holiday. Oh Thank Goodness! I searched and they have one minutes from me. I want that ham.... Seriously like NEED that ham! Honey baked ham is delicious! I would rather have theirs then mine any day! We love honeybaked ham for Easter! We also love to get it for Christmas Eve. Any occasion works for me, it's delicious AND I don't have to cook for days! This sounds really great. I can't even imagine an Easter dinner (or pre-Easter dinner) being on the table in an hour. What a lovely easter food preparation! I also got a notice from this blog opp but wasn't able to avail it coz we don't have Honeybaked ham store nearby. Lucky you! We get a Honeybaked ham every year for Easter & Christmas - love them! We love Honey Baked Ham. We usually get one for Easter! Its been forever since I have had Honeybaked ham. I love how they have side dishes now. I don't eat ham but I had no clue they had all those other yummy options! I need that carrot cake in my life! This is a great idea for an easy Easter lunch after church! Love those options to go with it too. I have never tried a Honey Baked Ham before. They look like they have lots of yummy stuff! I am soo ready for carrot cake, ham and deviled eggs! I love Honey Baked Ham. Thanks for the great giveaway! Wow! What an awesome giveaway with tons of chances! Why not? I love Honey Baked Ham! It sounds like the perfect place for our family too. My mom takes care of our special events, like Easter but she spends too much time in the kitchen, same as your mother in law. Your husband is funny, his face is all lighten up, I could tell how happy the ham makes him. I love those hams. We have a store near us in Baton Rouge. Most of my family and I like sweet ham. This is a grey tradition to start. Honey Baked Ham is is good! I would love to win this prize! My daughter and I LOVE our mother-daughter dates at Honey Baked Ham. The food is delicious and the employees are so friendly. Thank you for the opportunity to win this giveaway. It is one of our new favorite restaurants to war at together. I love honey baked hams. They are so delicious and tender, which reminds me to order mine for easter. YUM that ham looks delish. I love everything about big dinners except the actual cooking, haha, so this is perfect for me. Wish I had one near me! I would love to win this! We love ham! Yum I love honeybaked ham! they always hit the spot! To Beard, or Not to Beard? That is the Question!